C.G. Jung's (1921 / 1971) theory of psychological types attempts to categorize people in terms of their primary modes of psychological functioning. The theory is based on the assumption that there are different attitudes and functions of consciousness. The attitudes and functions operate as pairs of opposite and compensatory tendencies. According to Jung, whichever attitude or function dominates consciousness, its opposite will tend to be repressed and to characterise the compensatory activity of the unconscious. These unconscious tendencies can often be recognised through their expressions in dreams, or when the person is under stress, or intoxicated. The attitudes of consciousness refer to the basic direction in which a person's conscious interests and energies may flow - either inward to subjective, psychological experience, or outward to the environment of objects, other people and collective norms. 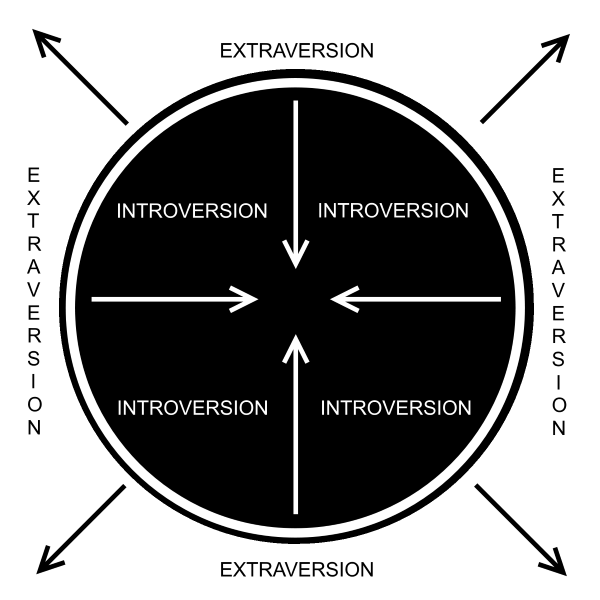 These two directions define the two opposite attitude types of (a) Introversion and (b) Extraversion. In Jung's theory, if the person's dominant conscious tendency is introverted, then the unconscious will attempt to compensate by expressing extraversion. Conversely, if the person is consciously extraverted, then unconscious tendencies will be introverted. The functions of consciousness refer to the different ways in which the conscious mind can apprehend reality. 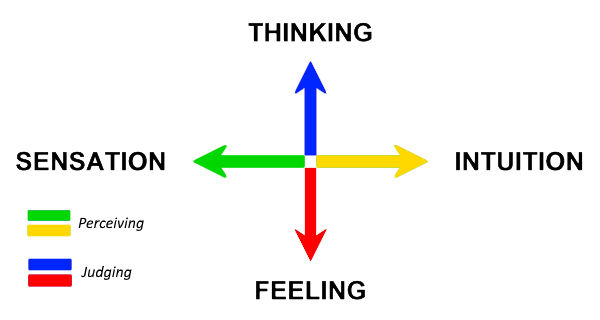 According to Jung, these are (a) Sensation, (b) Intuition, (c) Thinking and (d) Feeling. Sensation refers to our immediate experience of the objective world, a process that takes place without any kind of evaluation of the experience. Sensation perceives objects as they are - realistically and concretely. It fails to consider context, implications, meanings or alternative interpretations, but instead attempts to represent, factually and in detail, the information that is available to the senses. Intuition refers to a deeper perception of inherent possibilities and inner meanings. Intuitive perception ignores the details and focuses instead upon the general context or atmosphere. It perceives (without clear evidence or proof) the direction in which things are moving, the subtle inner relationships and underlying processes involved, or the latent potentialities of a situation. Intuition never directly reflects reality but actively, creatively, insightfully and imaginatively adds meaning by reading things into the situation that are not immediately apparent to a purely objective observer. Thinking is a mode of evaluation that is concerned with the truth or falsity of experience. It is based upon the intellectual comprehension of things and, in particular, of their conceptual interrelationships. It is a rational, systematic process that seeks to understand reality through analysis and logical inference. Feeling is an affective, sentimental function. It involves judging the value of things or having an opinion about them on the basis of our likes and dislikes. Experiences are therefore evaluated in terms of good and bad, pleasant or unpleasant, acceptable or unacceptable. Jung arranges these four functions into two pairs of opposites. Firstly there are the two perceiving (or, non-rational) functions of Sensation and Intuition. Secondly, there are the two judging (or, rational) functions of Thinking and Feeling. 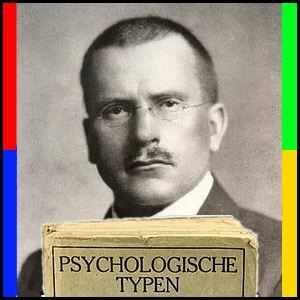 As with the psychological attitudes, Jung believes that whichever function dominates consciousness (e.g., Thinking), its opposite (e.g., Feeling) will be repressed and therefore will tend to characterise unconscious functioning. In addition to the dominant function, each person generally has an auxiliary (or, secondary) function. This will be one of the functions from the other pair. 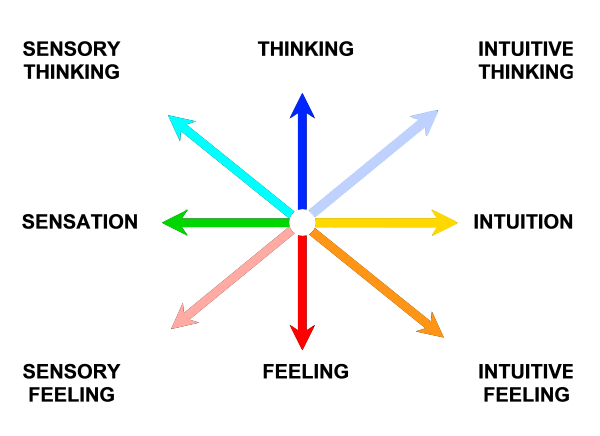 For example, if Thinking is dominant, the auxiliary function may be Sensation or Intuition (but not Feeling). It is often useful to refer to both the dominant and auxiliary functions and to describe someone's function type as, for example, Sensory Thinking or Intuitive Feeling. To give a complete description of a person's psychological type, we refer to both the attitude and function type. For example a person may be described as an Extraverted Feeling type, or an Introverted Intuitive Thinking type. When two functions are described, it is useful to indicate which is dominant and which is auxiliary. For example Extraverted Sensory Feeling might be expressed with either (1) Sensation dominant and Feeling auxiliary, or (2) Feeling dominant and Sensation auxiliary. In the following descriptions, only the eight major types are considered, in which there is one dominant function. Mixed types (where there is both a dominant and auxiliary function) may be understood as combinations of the two corresponding major types. Thus an Introverted Intuitive Thinking type may be seen as a combination of Introverted Intuition and Introverted Thinking. If Intuition is the dominant function, then Introverted Intuition will predominate over Introverted Thinking. Extraverted sensation strives for intensity of experience derived from concrete objects and physical activities. Consciousness is therefore directed outward to those objects and activities that may be expected to arouse the strongest sensations. The extraverted sensation type is a realist who seeks to experience as many concrete sensations as possible - preferably, but not necessarily, ones that are pleasurable. These experiences are seen as ends in themselves and are rarely utilized for any other purpose. If normal, such persons are sensualists or aesthetes who are attracted by the physical characteristics of objects and people. They dress, eat and entertain well, and can be very good company. Not at all reflective nor introspective, they have no ideals except sensory enoyment. They generally mistrust inner psychological processes and prefer to account for such things in terms of external events (e.g., they may blame their moods on the weather). If extreme, they are often crudely sensual and may exploit situations or others in order to increase their own personal pleasure. When neurotic, repressed intuition may be projected onto other people, so that they may become irrationally suspicious or jealous. Alternatively, they may develop a range of compulsive superstitions. Introverted sensation is subjectively filtered. Perception is not based directly on the object, but is merely suggested by it. Instead, layers of subjective impressions are superimposed upon the image so that it becomes impossible to determine what will be perceived from a knowledge only of the object. Perception thus depends crucially upon internal psychological processes that will differ from one person to the next. At its most positive, introverted sensation is found in the creative artist. At its most extreme, it produces psychotic hallucinations and a total alienation from reality. The introverted sensation type reacts subjectively to events in a way that is unrelated to objective criteria. Often this is seen as an inappropriate and uncalled-for overreaction. Because objects generally fail to penetrate directly the veil of subjective impressions, this type may seem neutral or indifferent to objective reality. Alternatively, the person may perceive the world as illusory or amusing. In extreme (psychotic) cases, this may result in an inability to distinguish illusion from reality. The subjective world of archaic images may then come to dominate consciousness completely, so that the person lives in a private, mythological realm of fantasy. Repressed intuition may also be expressed in vaguely imagined threats or an apprehension of sinister possibilities. Extraverted intuition attempts to envisage all the possibilities that are inherent in an objective situation. Ordinary events are seen as providing a cipher or set of clues from which underlying processes and hidden potentialities can be determined. Yet once these possibilities are apprehended, objects and events lose their meaning and import. There is therefore a constant need for new situations and experiences to provide a fresh stimulus for the intuitive process. The extraverted intuition type is an excellent diagnostician and exploiter of situations. Such people see exciting possibilities in every new venture and are excellent at perceiving latent abilities in other people. They get carried away with the enthusiasm of their vision and often inspire others with the courage of their conviction. As such, they do well in occupations where these qualities are at a premium - for example in initiating new projects, in business, politics or the stock market. They are, however, easily bored and stifled by unchanging conditions. As a result they often waste their life and talents jumping from one activity to another in the search for fresh possibilities, failing to stick at any one project long enough to bring it to fruition. Furthermore, in their commitment to their own vision, they often show little regard for the needs, views or convictions of others. When neurotic, repressed sensation may cause this type to become compulsively tied to people, objects or activities that stir in them primitive sensations such as pleasure, pain or fear. The consequence of this can be phobias, hypochondriacal beliefs and a range of other compulsions. Introverted intuition is directed inward to the contents of the unconscious. It attempts to fathom internal events by relating them to universal psychological processes or to other archetypal images. Consequently it generally has a mythical, symbolic or prophetic quality. According to Jung, the introverted intuition type can be either an artist, seer or crank. Such a person has a visionary ideal that reveals strange, mysterious things. These are enigmatic, 'unearthly' people who stand aloof from ordinary society. They have little interest in explaining or rationalizing their personal vision, but are content merely to proclaim it. Partly as a result of this, they are often misunderstood. Although the vision of the artist among this type generally remains on the purely perceptual level, mystical dreamers or cranks may become caught up in theirs. The person's life then becomes symbolic, taking on the nature of a Great Work, mission or spiritual-moral quest. If neurotic, repressed sensation may express itself in primitive, instinctual ways and, like their extraverted counterparts, introverted intuitives often suffer from hypochondria and compulsions. Extraverted thinking is driven by the objective evidence of the senses or by objective (collective) ideas that derive from tradition or learning. Its purpose is to abstract conceptual relationships from objective experience, linking ideas together in a rational, logical fashion. Furthermore, any conclusions that are drawn are always directed outward to some objective product or practical outcome. Thinking is never carried out for its own sake, merely as some private, subjective enterprise. The extraverted thinking type bases all actions on the intellectual analysis of objective data. Such people live by a general intellectual formula or universal moral code, founded upon abstract notions of truth or justice. They also expect other people to recognize and obey this formula. This type represses the feeling function (e.g., sentimental attachments, friendships, religious devotion) and may also neglect personal interests such as their own health or financial well-being. If extreme or neurotic, they may become petty, bigoted, tyrannical or hostile towards those who would threaten their formula. Alternatively, repressed tendencies may burst out in various kinds of personal 'immorality' (e.g., self-seeking, sexual misdemeanours, fraud or deception). Introverted thinking is contemplative, involving an inner play of ideas. It is thinking for its own sake and is always directed inward to subjective ideas and personal convictions rather than outward to practical outcomes. The main concern of such thinking is to elaborate as fully as possible all the ramifications and implications of a seminal idea. As a consequence, introverted thinking can be complex, turgid and overly scrupulous. To the extent that it withdraws from objective reality, it may also become totally abstract, symbolic or mystical. The introverted thinking type tends to be impractical and indifferent to objective concerns. These persons usually avoid notice and may seem cold, arrogant and taciturn. Alternatively, the repressed feeling function may express itself in displays of childish naivety. Generally people of this type appear caught up in their own ideas which they aim to think through as fully and deeply as possible. If extreme or neurotic they can become rigid, withdrawn, surly or brusque. They may also confuse their subjectively apprehended truth with their own personality so that any criticism of their ideas is seen as a personal attack. This may lead to bitterness or to vicious counterattacks against their critics. Extraverted feeling is based upon accepted or traditional social values and opinions. It involves a conforming, adjusting response to objective circumstances that strives for harmonious relations with the world. Because it depends so much on external stimuli rather than upon true subjective preferences, such feeling can sometimes seem cold, 'unfeeling', artificial or put on for effect. The extraverted feeling type follows fashion and seeks to harmonize personal feelings with general social values. Thinking is always subordinate to feeling and is ignored or repressed if intellectual conclusions fail to confirm the convictions of the heart. When this type is extreme or neurotic, feeling may become gushing or extravagant and dependent upon momentary enthusiasms that may quickly turn about with changing circumstances. Such a person may therefore seem hysterical, fickle, moody or even to be suffering from multiple personality. Repressed thinking may also erupt in infantile, negative, obsessive ways. This can lead to the attribution of dreaded characteristics to the very objects or people that are most loved and valued. Introverted feeling strives for an inner intensity that is unrelated to any external object. It devalues objective reality and is rarely displayed openly. When it does appear on the surface, it generally seems negative or indifferent. The focus of such feeling is upon inner processes and latent, primordial images. At its extreme, it may develop into mystical ecstasy. The introverted feeling type is brooding and inaccessible, although may also hide behind a childish mask. Such a person aims to be inconspicuous, makes little attempt to impress and generally fails to respond to the feelings of others. The outer, surface appearance is often neutral, cold and dismissive. Inwardly, however, feelings are deep, passionately intense, and may accompany secret religious or poetic tendencies. The effect of all this on other people can be stifling and oppressive. When extreme or neurotic, this type may become domineering and vain. Negative repressed thinking may also be projected so that these persons may imagine they can know what others are thinking. This may develop into paranoia and into secret scheming rivalries. The Myers-Briggs Type Indicator® or MBTI® (Myers and McCaulley, 1985) is the most widely used measure of Jungian psychological type. The MBTI is a self-report questionnaire that assesses type preferences on Extraversion-Introversion (E-I), Sensation-Intuition (S-N), Thinking-Feeling (T-F), and also on Judgment-Perception (J-P). The J-P scale defines the person's preferred manner of dealing with the outer world. Judging reflects a closed, organised, decisive approach, whereas Perceiving is more open, flexible and curious. J-P is not specifically recognised as a separate dimension in Jung's theory, and it is included in the MBTI mainly as a way of indirectly determining which function is dominant. MBTI types are described using four letters that indicate the person's preferences on each scale. This results in sixteen types. These types, and their classical Jungian equivalents, are shown in the table below. In the Jungian types, the function in brackets is the auxiliary. Thus IS(T) refers to an Introverted Sensory Thinker with Sensation dominant, whereas IT(S) is the same type, but with Thinking dominant. Bayne, R. (1995). The Myers-Briggs Type Indicator: A Critical Review and Practical Guide. London: Chapman & Hall. Jung, C.G. (1971). Psychological Types. London: Routledge & Kegan Paul. (Collected Works of C.G. Jung, Vol. 6). Myers, I.B. with Myers, P.B. (1980). Gifts Differing. Palo Alto, Ca. : Consulting Psychologists Press. Myers, I.B. and McCaulley, M.H. (1985). Manual: A Guide to the Development and Use of the Myers-Briggs Type Indicator. Palo Alto, Ca. : Consulting Psychologists Press.